Last week, I was privileged to attend part of the Creative Leadership Academy held at The Boulders in Carefree, Arizona. 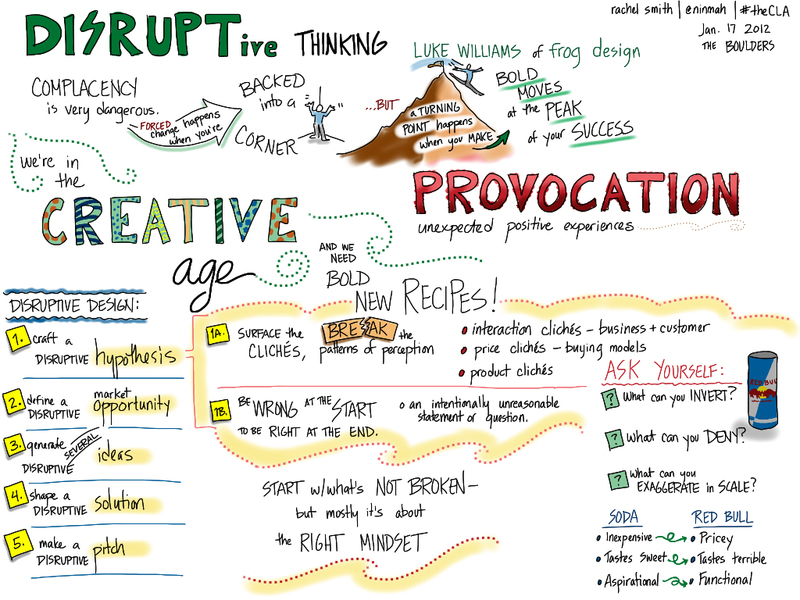 I listened to inspiring talks by “provocateurs” Chris Waugh (IDEO) and Luke Williams (Frog Design fellow and author of Disrupt), and I participated in the workshop Cultivating a Kaleidoscope Mind, presented by Laura Seargeant Richardson and Ben McAllister of Frog Design. I also delivered the closing workshop, Visual Meetings and Teams: The Key to Practical Application of Creative Leadership. Chris Waugh spoke about experience design after the reception on Tuesday evening (tough slot). He captured our attention by providing foam missiles and inviting a few intrepid volunteers to step up on stage to experience what a design critique often feels like — we stood there while the rest of the room pelted us with the rubber band-propelled missiles. I found it strongly reminiscent of my college courses in studio art. Chris showed examples of strikingly user-friendly or innovative product design and told the story behind each one. Unfortunately I hadn’t brought my iPad to the reception, so I didn’t take notes during his excellent talk. By the time my workshop rolled around, everyone in the group was filled to the brim with ideas about creative leadership. I gave an introduction to Visual Meetings using the presentation David Sibbet created with Prezi, and then the plan was to map out our collective learning journey describing how to implement all the wonderful ideas from the past three days. There was a gentle mutiny, though, and instead we practiced drawing seed shapes (star people and other basic icons). I think everyone was pretty tapped out by then, but they all jumped in and practiced the drawings, and the energy level in the room just shot up. We also talked about using the iPad for graphic recording, which wasn’t formally on the agenda, but somehow someone always asks about it anyway. I was assisted during the workshop by my amazing and talented sister, Sonja Stone (the author). It was a great group of folks, and we definitely achieved the session objective of having a good time! Overall, I appreciated the practical advice given by the other speakers about how to be creative. I know that sounds a little counter-intuitive, but creativity is often sparked by thinking about old ideas in new contexts, and the Academy demonstrated lots of different ways to achieve that. Posted in everything. Tagged with conferences, ipad, thecla, workshop.